The centre of their territory isn't known, but may have been Brough-on-Humber (the Roman civitas of Petuaria). The name Petuaria derives from the Celtic word for 'fourth', suggesting this area was only one of at least four regions within the territory. That being the case, there may be other tribal capitals to be discovered in modern East Yorkshire. Edward Dawson suggests the Parisi territory was much smaller than is usually thought. Ptolemy says '...on the Opportunum bay are the Parisi and the town Petuaria', but taking 'on the bay' literally would place them only in the Petuaria district, the 'fourth' region mentioned above. This was the region which came to be known as Deywr by the Britons and which was given to the Deiran Angles when they were introduced to provide mercenary defence of the coastline. Were the Parisi in fact only very late incomers who were fleeing Julius Caesar's conquests (along with Veneti and other Belgic refugees)? Did they take over the fourth region of another tribe's territory in the middle of the first century BC, with their name later being taken by Rome as that of the entire region, or were there always links between the two groups, dating back to about 300 BC and the start of Arras culture burial practises in East Yorkshire? The Parisi name possibly derived from the proto-Celtic 'kwarjo' (a word conjectured by linguists and meaning kettle). The 'kw' became 'p', so 'Parjo', or people of the kettle. In reaching this result, Edward Dawson questions whether the Parisi might be related to the Belgae. Given the similarity of their name with that of the Parisii tribe in Gaul, he suggests a recent split from them or a migration from Gaul to Britain, a notion which is discounted by some scholars. Instead, this may have happened the other way around, with elements of the British Parisi arriving in Gaul, or (even more likely) the tribe dividing before arriving in either location. Despite the lack of evidence to enable any firm conclusion to be drawn, the Parisi were certainly in evidence by the start of the first century AD. This first century influx may have settled amongst fourth century arrivals, which may also explain the division of the territory - into three quarters of the original people and one quarter of the latest arrivals. The territory re-emerged following the Roman period as the Romano-British kingdom of Ebrauc. Within its borders, occupying the north bank of the Humber Estuary, was the region known as Deywr. This name may have emerged from an earlier one, something along the lines of Deparis (or Deparisi with the Roman suffix attached), possibly to signal a colony of Parisi that was founded away from the central body of the tribe. Judging by burial practises in the region, the early Parisi probably occupy their territory by this date. Whether they are related to the Parisii tribe in Gaul is unknown, but they seem to be a late arrival in the migration of those Celtic tribes which are dominant by the first century AD. The Parisi bury their dead under small barrows that are surrounded by square ditches. Some nobles are buried with their chariots, part of the Arras culture which is otherwise unusual in Britain. Farming the chalk hills of East Yorkshire, the tribe also trades by boat, with one logboat (later uncovered by archaeologists at Hasholme) bearing a cargo of wood and beef when it sinks in this period. Although there are few burials in Britain at this time, the Parisi territory is an exception (along with that of the Votadini). One burial in what is now Kirkburn involves a man who is in his late twenties or early thirties, something approaching late middle-age at best for this period. After his body is placed in the grave and a fine sword is placed alongside him, three spears are thrust into his chest as part of the funeral ritual. Another man of a similar age is buried in the same small cemetery, but with a dismantled chariot or cart. Although the site has been occupied since the fifth millennium BC, the hill fort of Burrough Hill begins its most intensive phase of occupation around this time, which lasts until around the time of the Roman invasion of AD 43. Burrough Hill is eleven kilometres (seven miles) to the south of Melton Mowbray in Leicestershire, in the East Midlands, well inside Corieltavi territory at this time. In 2014, the University of Leicester announces that it has uncovered the remains of a chariot burial on the hill, an extremely rare find outside of the territory of the Parisi . 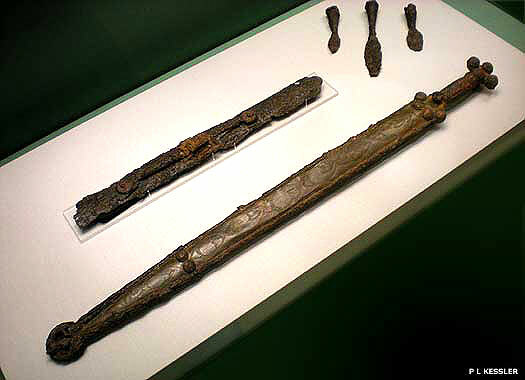 The burial dates from the third or second century BC and the chariot is either dismantled, or has never been assembled. It most likely signifies the passing of a high-status individual, and seems to suggest a level of influence from the culturally equal Parisi - possibly intermarriage and a mixing of customs, to expound just one theory. There appears to be a further influx of people who go towards forming the Parisi tribe that is encountered by Rome in the following century. It may be this influx which is formed by émigrés from the Parisii tribe of Gaul. It is probably also they who occupy the Petuaria region (Brough-on-Humber), the 'fourth' region of the Parisi territory, which is handy for its coastline, making it an idea place for new arrivals to land and settle. By this period, the practice of chariot burials has ceased, the only major aspect of Parisi culture which had matched that of many Celtic tribes on the Continent. Now, the Parisi probably accept the arrival of the Romans as easily as their neighbours, the Brigantes. Certainly there is no record of them offering any resistance to the invaders, and no leaders are recorded, making it unlikely that any armed conflict is involved. Perhaps the tribe is not even fully unified, which is a possibility given the four regions or more which may make up the territory. The Romans under Governor Aulus Plautius are apparently welcomed once they reach Corieltavi territory, although perhaps some persuasion is needed initially. It is also possible that the Corieltavi ruler, Volisios, moves his camp into Parisi territory and remains here for some years after the Roman capture of the Corieltavi territory. The Roman city of York is founded as the capital of the north, a sobriquet which it retains today. As Roman administration of Britain is reorganised in preparation for the invasion of the Continent by Magnus Maximus, Coel Hen is apparently appointed Governor of the north. He eventually comes to be styled king of Northern Britain (but perhaps only by later writers). The territory he commands becomes increasingly fragmented under his successors during the emergence of post-Roman Britain, with Ebrauc forming a kingdom that occupies much of the former Parisi territory, which itself emerges as a region named Deywr.